Control Panel is the traditional and classic settings and configuration area which prominently used almost since the inception of Windows operating system. Control Panel allows user to make various changes and personalization to Windows system from one single place. Beginning from Windows 8, Microsoft began to move or duplicate the configuration settings that originally reside in Control Panel to new UWP Settings app, while at the same time, add new configuration options to only Settings app. The effort to make Settings the central place to configure Windows accelerated in Windows 10. However, Control Panel is not dead yet, as there are still plentiful of legacy commands, settings and options located at Control Panel, not migrated to modern Settings yet. Even though Control Panel and Settings are not merged yet, Microsoft has it less obvious and harder to open Control Panel, especially with the arrival of Windows 10 Creators Update (Version 1703), or more specifically beginning from Windows 10 Build 14942. 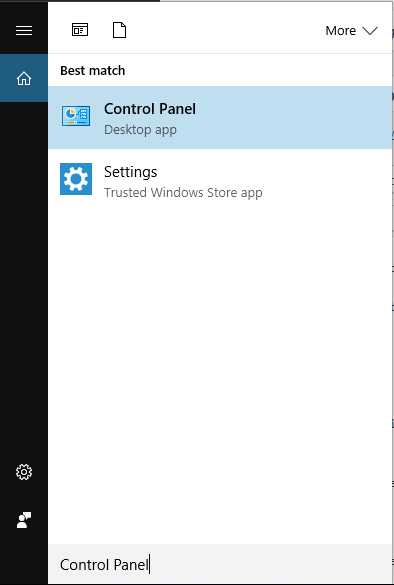 However, there are still several ways to quickly open Control Panel in Windows 10, as follow. 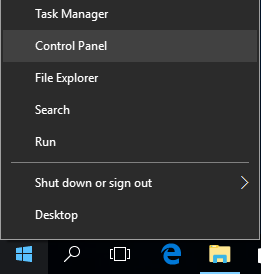 Search by typing Control Panel into the search box on Taskbar, or directly at Start Menu or Start Screen, or speak to Cortana, remains to be the most consistent and probably the fastest way to open Control Panel for the life of Windows 10 operating system. Once Search returns the results, just click or tap on Control Panel to open it. Beginning from Windows 10 Build 14942 for Windows Insiders or Windows 10 Creators Update Version 1703 for other Windows system, the WinX menu shows Settings by default, instead of Control Panel. 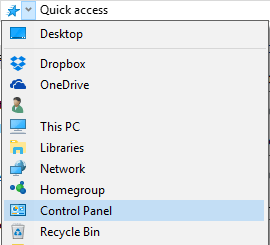 However, you can change Settings to Control Panel in Win-X Quick Access menu. Press Windows + X keys simultaneously, or right click on the Start (Windows icon on Taskbar) to open WinX Quick Access menu. Click or tap on Control Panel in the menu. 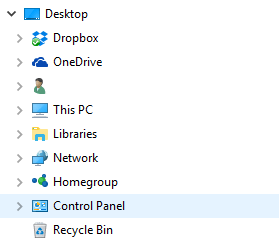 In the File Explorer, click or tap on first arrow right after the folder or location icon on the left side in the address bar, and then click or tap on Control Panel in the menu. If you enabled the “Show all folders” for navigation pane in Folder Options, you can simply click or tap on Control Panel in the navigation pane. Press Win + R keys simultaneously to open Run dialog. Type control and hit Enter to run Control Panel (the “control” command will call C:\Windows\System32\control.exe).